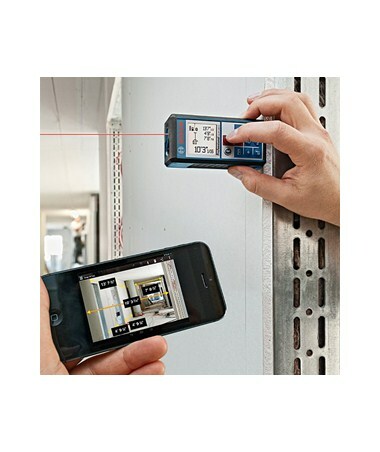 The Bosch GLM 100 C Laser Distance Meter with Bluetooth wireless technology allows construction professionals to instantly transfer measurements to a compatible smartphone or tablet and use that same handheld device to capture photos and integrate them with the measurements from your laser rangefinder. The Bosch laser distance meter is accurate to ±1/16” and is handy for difficult measurements unreachable with a traditional tape measure. You can even use your smart device as a remote control (via Bluetooth) when working in hard-to-reach areas. You can also set the timer function for delayed-action measuring. The GLM100 has a built-in tilt sensor that displays 360° angle measurement in two axes for highly-accurate results. This laser distance meter features a large illuminated display that flips automatically depending on the orientation of the instrument. It has four measuring reference points – you can choose which part of the device acts as the starting point for your measurements. The GLM 100 attaches easily to a tripod with the 1/4 x 20 thread. 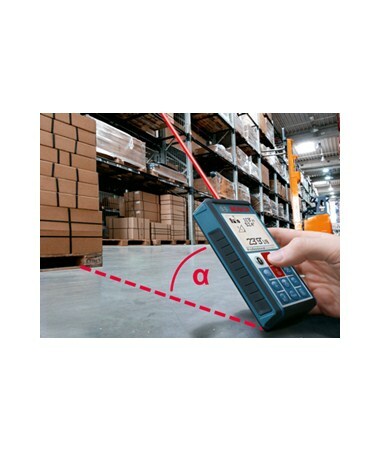 Featuring Bluetooth wireless technology, the Bosch GLM 100C laser measure enables you to instantly transfer measurements, manage projects and make calculations using the free Bosch measurement mobile app. The app syncs with compatible Android and Apple iOS mobile devices to determine length, area, and volume as well as angles and multi-surface distances all into your smartphone, allowing you to sketch or overlay measurements on jobsite photos. It works with the free Bosch apps GLM Measure&Document (Android 2.2 or iOS 7.0 and up) and GLM Floor Plan (Android 4.0 or iOS 7.0 and up). 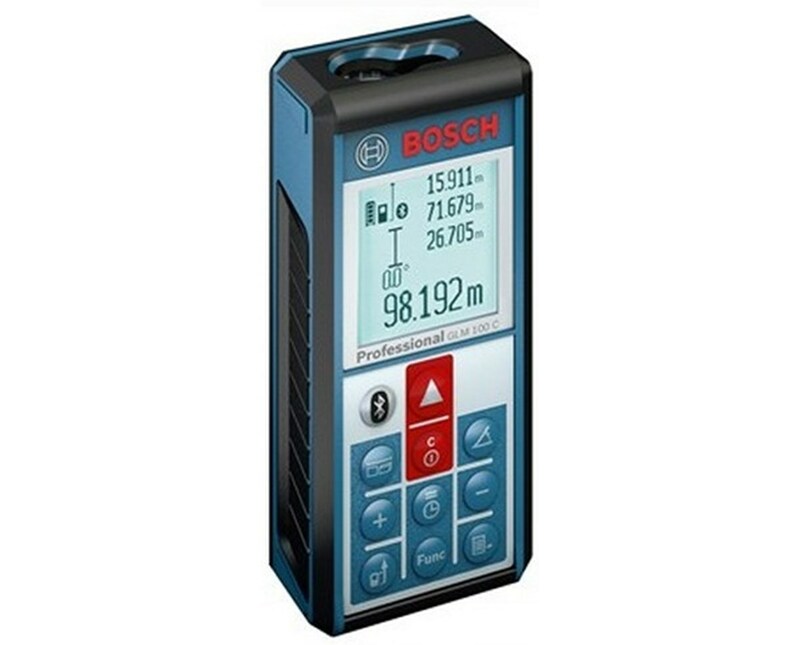 This Bosch hand-held laser tool is ideal for indoor and outdoor use with its ten measuring modes – length, area, volume, angle, minimum/maximum, continuous, single indirect height, single indirect length, combined indirect height, and multi-surface area. The Bosch GLM100C Professional is the smart solution for transferring and documenting measuring results with data transfer via Bluetooth and micro USB. It also features automatic storage of the last 50 measurements. Outside dimensions of this laser distance meter are 6.50”L x 9.25”W x 3.00”H. It weighs 1.35 lbs. 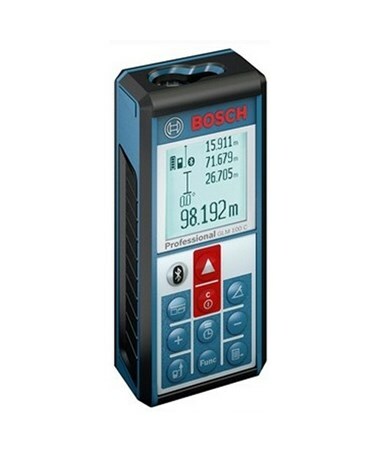 With an IP54 rating, this Bosch distance laser is dust and water splash protected. It shuts off automatically after five minutes to conserve power and has an integrated rechargeable Li-Ion battery that takes up to 25,000 measurements on a single charge. 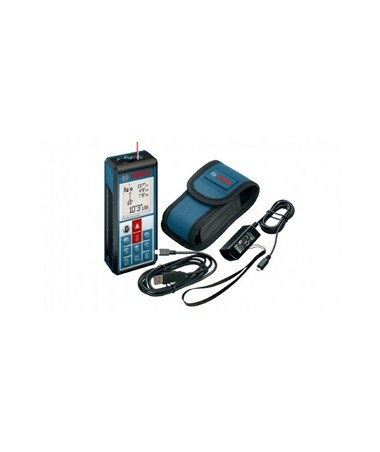 This Bosch laser distance meter comes with a belt pouch, USB data cable, rechargeable battery, micro USB charger and 3-year manufacturer’s warranty.